Pressure Builds On Egypt's Morsi To Compromise Or Step Down : The Two-Way As a deadline set by the military looms, President Mohammed Morsi is being pushed to find a way to address the complaints of protesters. The army says it is not planning a coup. But Morsi's supporters say that's just what is happening. Hundreds of thousands of demonstrators gathered in Cairo's Tahrir Square again Monday during a protest calling for the ouster of President Mohammed Morsi. With about 24 hours to go before the deadline set by Egypt's military to work with opponents and craft a roadmap that moves the country past its political problems or have one created for him by the army, Egyptian President Mohammed Morsi is under intense pressure. He must either "reach some kind of compromise" with those protesting against his government "or step aside," NPR's Soraya Sarhaddi Nelson tells our Newscast Desk. "Morsi rebuffed an army ultimatum to force a resolution to Egypt's political crisis, saying on Tuesday that he had not been consulted and would pursue his own plans for national reconciliation. ... The Islamist leader looked increasingly isolated, with ministers resigning, the liberal opposition refusing to talk to him and the armed forces, backed by millions of protesters in the street, giving him until Wednesday to agree to share power." The BBC adds that "Egypt's state news agency Mena reported early on Tuesday that Foreign Minister Mohamed Kamel Amr had submitted his resignation. If accepted, he would join at least five other ministers who have already reportedly resigned over the political crisis." 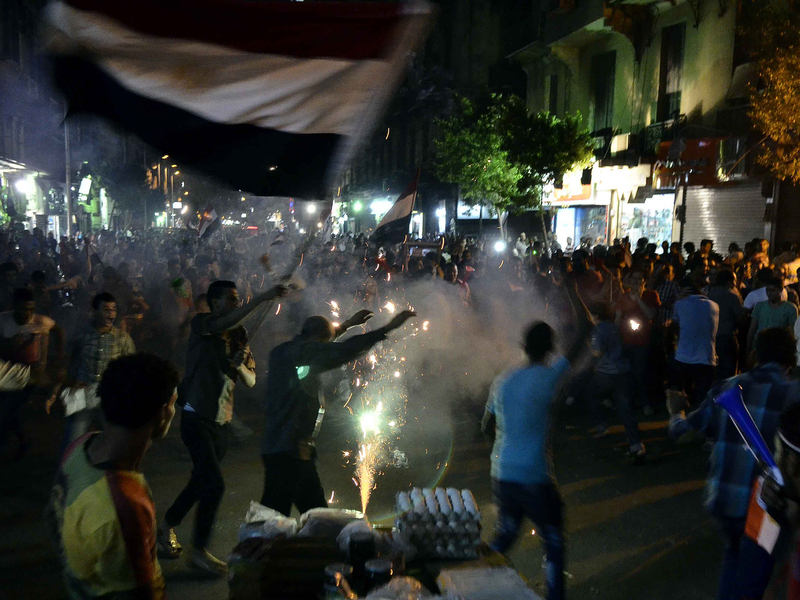 Fueled by discontent over Egypt's deep economic problems, protests against Morsi and his government in recent days have rivaled in size those that were held in early 2011 as anger grew about the regime of then-President Hosni Mubarak. On Morning Edition, Soraya noted that the Egyptian military says it is not planning a coup against Morsi's year-old, democratically elected government. But retired Army Gen. Sameh Seif al-Yazal told her that he believes Egyptian military leaders will move up presidential elections now scheduled for 2016 and possibly set up a presidential committee of mostly civilian members to run the country in the interim. More anti-Morsi protests are expected today. The president's supporters are also going to be out — raising the possibility of more clashes. As The Guardian reports in its live blog of the news from Egypt, "Islamists have taken to the streets of Cairo to express opposition to [what they see as] a threatened military coup."